One of the greatest dangers I face every day is being crushed by one of the towering stacks of books that seem to cover every horizontal surface. Books I have read, books I want to read, my own books, books I’ve edited, my friends’ books. Sure, there are a precious few I know I’ll read again—like the Gaslight series by Nene Adams and Josh Lanyon’s Adrien English books—but as for the rest, well, there’s a good chance that once I’m done with them, they’re going to loom menacingly in their stacks until disaster strikes. Which is why I did a bit of nosing around to see how those books might be put to better, or at least nonlethal use. Hospitals and, particularly, dialysis centers, use books in a couple of different ways. Sometimes they sell them in order to raise money for services. In addition, many facilities stock books for the enjoyment of patients and guests during lengthy procedures. If you’re interested in donating books to a medical facility, it’s best to contact that facility directly. Many of them will even pick up from your home. NB: nursing homes usually prefer large-print publications. Books donated to libraries don’t usually end up on library shelves. Generally, libraries will sell donated books in order to supplement their funding, which has been increasingly subject to budget cuts. Look for your local Friends of the Library organization for more details. Paperbackswap.com allows users to swap used books for the price of shipping. Shipping is paid by the sender, and the website provides pre-printed labels with the recipient’s address. There’s even an option for purchasing a label printed with the correct postage and a tracking number. At LittleFreeLibrary.org, you can learn how to build (or purchase) your own neighborhood lending library, stock it with your used books, and list it on the international website. It’s a great way to recycle your books, and to meet your neighbors! Vietnam Veterans of America will pick up your used books anywhere in the United States—you can even schedule your pickup online—and sell them to benefit services and programs for Vietnam veterans. Just go to http://www.pickupplease.org to schedule your donation. So take a tip from someone who lives under constant threat of Library Avalanche. 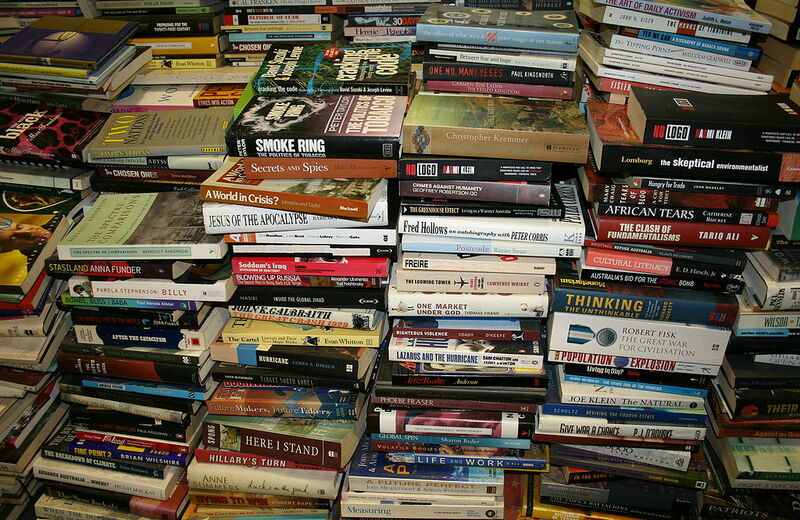 Save the books that you plan to reuse, and recycle the rest in a way that benefits others.